Will we participate in the Super Outbreak of the 21st Century? Weburg - Tonight, Maxisland may expect to see the same scenes that have been happening in the Southern United States. The Maxisland Weather Service has just issued a Tornado Watch at 10:00 AM Atlantic Daylight Time. The storm already has had produced deadly tornadoes, such as one that touched down in North Carolina. 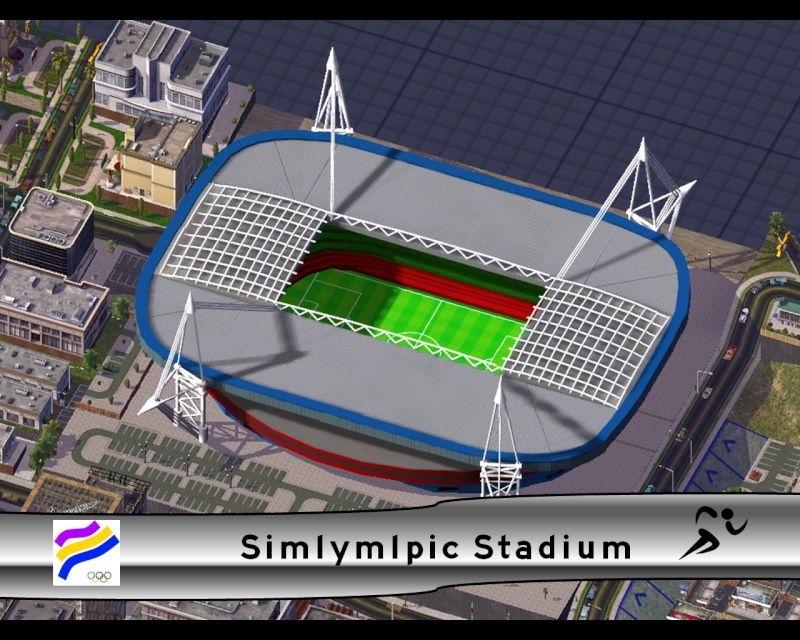 It is still unknown whether or not the storm will affect Weburg's ongoing June 2011 Simlympic bid. Tornado sirens throughout the nation are expected to sound tonight. The last time a deadly tornado struck Maxisland was in 1996, when an F4 flattened parts of Bevopolis, killing 17 people, mainly due to the fact that the meteorologist at Bevopolis's MBC affiliate fell asleep and was unable to issue the Emergency Broadcast System and the fact that Bevopolis had no tornado sirens. Since then, the T-35, the loudest tornado siren, was installed on the roof of Bevopolis's tallest building. Stay tuned to MWS Weather Radio or local TV and radio stations for further details on the storm. Are we even participating in the next Simlympics? Weburg - The recent civil war in Quandt has spurred prime minister Ned Ferro to issue an ultimatum that Maxisland would boycott the June Simlympiad if the war does not end at 12:01 AM Atlantic Daylight Time Friday. An announcement will be made the night after the 17th ISC Session. If Weburg wins, then Maxisland will participate whatever or not the war ends, if Weburg loses and the war ends, Maxisland will still participate, if Weburg loses and the war does not end, then Maxisland will not participate at all. No word has been confirmed yet if MBC and it's partners will even air the Games. 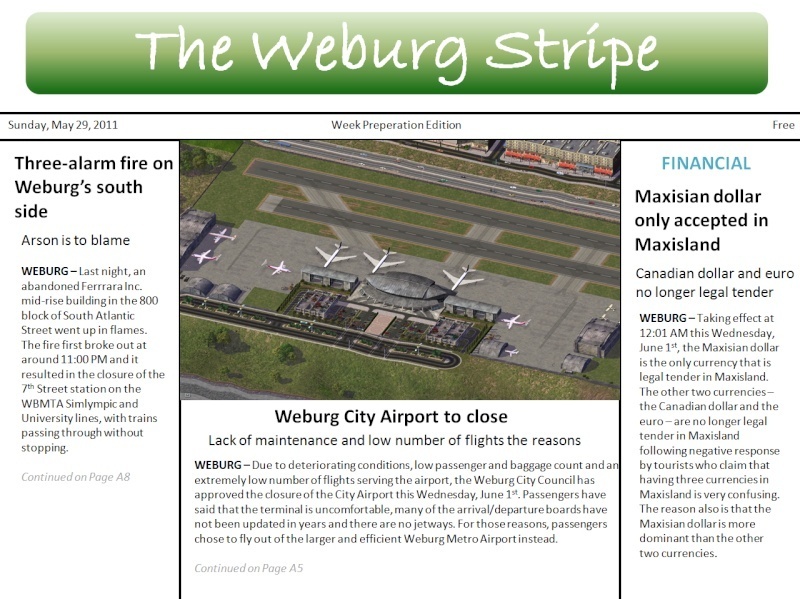 WEBURG – Due to deteriorating conditions, low passenger and baggage count and an extremely low number of flights serving the airport, the Weburg City Council has approved the closure of the City Airport this Wednesday, June 1st. Passengers have said that the terminal is uncomfortable, many of the arrival/departure boards have not been updated in years and there are no jetways. For those reasons, passengers chose to fly out of the larger and efficient Weburg Metro Airport instead. Charles Jay Abernathy bought a piece of land south of Weburg's CBD in 1933 and built Weburg Municipal airport, which had one grass runway. Then in 1941, with the onslaught of World War II and the German Luftwaffe's plan to bomb Maxisland (which was then a British territory), he gave the airport to the British government to use as a site to build Avro Lancaster heavy bombers. After the war, the airport was converted into a passenger airport and renamed to it's present name. The British government sold the airport to the city of Weburg in 1947 for $250 Maxisian. For some time, the apartments along Airport Boulevard which once housed plant workers were used as city offices. In 1960 passenger traffic began to shift to the newer Weburg Metro Airport. It was once a Spirit Airlines focus city between 1995 and 1997. Currently, only 2 Southwest Airlines flights fly out of City Airport to Chicago Midway Airport and Airtran operates a nightly flight to Orlando. WEBURG – Last night, an abandoned Ferrrara Inc. mid-rise building in the 800 block of South Atlantic Street went up in flames. The fire first broke out at around 11:00 PM and it resulted in the closure of the 7th Street station on the WBMTA Simlympic and University lines, with trains passing through without stopping. After six hours, the fire was finally put out by firefighters from Weburg, Bendburger and Rivertner. Despite this, trains are still passing through the 7th Street WBMTA station without stopping and Atlantic Street between Pelham Avenue and 7th Street remains closed to thru traffic.